A tense thriller set after World War Two but otherwise containing all the elements of a Western, Bad Day At Black Rock is a small movie with a long reach. An excellent cast extends to the minor roles, and the ethos of a mysterious stranger arriving unannounced in a small town harbouring a dark secret would continue to resonate for decades in the hands of the likes of Sergio Leone and Clint Eastwood. 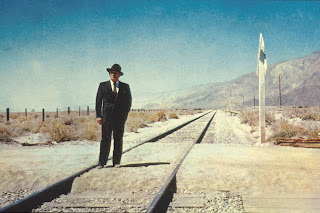 John Macreedy (Spencer Tracy) arrives by train to the small town of Black Rock in the middle of the desert. A one-armed World War Two veteran dressed in a black suit and black hat, Macreedy immediately makes himself unpopular with the suspicious locals by asking for directions to the home of a local man named Komoko. Hotel clerk Pete (John Ericson) is unwelcoming, while roughnecks Coley (Ernest Borgnine) and Hector (Lee Marvin) try to intimidate Macreedy and run him out of town. 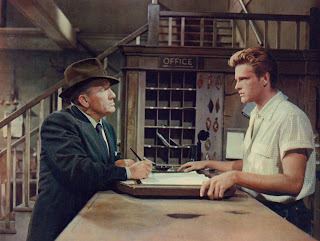 Undeterred, Macreedy seeks out the local Sheriff Tim Horn (Dean Jagger), but finds him to be useless. Meanwhile the town veterinarian Doc Velie (Walter Brennan) and Pete's sister Liz (Anne Francis) are slightly friendlier but still less than forthcoming. The unofficial town leader Reno Smith (Robert Ryan) pretends to befriend Macreedy while still urging him to leave, but gradually Macreedy uncovers Smith's central role in the dirty secret involving the missing Komoko. Black Rock is a clutch of ramshackle buildings that time has forgot, and where the train stops reluctantly and only upon request. Director John Sturges therefore has a well-defined closed system to operate in, with Macreedy the single outside factor agitating the fragile alliance built by the locals to protect their secret. It's a simple but effective structure deployed in later examples by Leone in A Fistful Of Dollars (1964) and Eastwood in High Plains Drifter (1973). CinemaScope may seem like an odd choice for a small film about a dirty town secret, but Sturges uses it to his advantage. The wide camera angles emphasize just how small and isolated Black Rock is, a town where horrible things can happen to good people and the rest of the world will be none the wiser. Sturges maintains a taut compactness throughout Bad Day At Black Rock, with no wasted scenes to prolong the 81 minutes of running length. Characters are introduced quickly through the eyes of Macreedy, with quick interactions sharply defining each local's position in the town's hierarchy, from the spineless (the Sheriff) to the smoothly intimidating (Smith). Spencer Tracy creates an unforgettable character in John Macreedy. Unflappable in black under the scorching sun and not allowing his handicap to slow down his martial arts skills, Macreedy personifies coolness and always appears to be several steps ahead of the locals conspiring against him. Robert Ryan makes for a smooth villain, his smile concealing a cold master of puppets working hard to keep the town in line. Ernest Borgnine and Lee Marvin enjoy the roles of tough guys given the freedom to unleash brutality on the new guy. Although easy to guess, the secret at the centre of Bad Day At Black Rock pokes away at the scar tissue surrounding the mistreatment of Americans of Japanese descent during the War, giving the movie a modern social message to go along with its Western stylistic elements. Tracy, in his mid-fifties, may be difficult to imagine as a just-returned active war duty veteran, but a town struggling with a dark past needs a mythical warrior for justice more than an ordinary man, and John Macreedy readily delivers the bitter but required medicine.